Breadlines are making a mockery of the government's boasts of plenty. Soviet-style breadlines are a regular sight in Turkmenistan these days. RFE/RL’s Turkmen Service, Radio Azatlyk, reported last week that shoppers seeking to purchase flour at one store in the city of Turkmenabad were required to produce proof of residence in order to do so. Even then, they faced lengthy waits. The outlet also noted that where bread cost only one manat in Ashgabat stores one month ago, the price has now reached five manat. The Vienna-based Chronicles of Turkmenistan reported that its correspondents in Dashoguz have noted an increase in the number of people begging in the city – not just for money but for food too. In its report on breadlines in Dashoguz, Netherlands-based Alternative News of Turkmenistan, or ANT, said that police in plainclothes are scouring crowds for people expressing discontent or, even worse, taking photos of the huge queues of unhappy shoppers. The rage is only just beneath the surface. ANT claimed in one report that dentists from the city of Mary are being forced to work in cotton fields in near-freezing temperatures. One worker quoted by ANT said angrily that he thought Turkmenistan’s “dentist-in-chief” – a reference to President Gurbanguly Berdymukhamedov, who is a dentist by training – should have been sent into the fields instead. Berdymukhamedov does not acknowledge crises as such, so observers are forced to rely on the regular personnel reshuffles to detect stress points. On November 16, he dismissed Water and Agriculture Minister Ovezmyrat Enermyradov and appointed Annageldi Yazmyradov in his place. Yazmyradov’s portfolio will include implementation of Berdymukhamedov’s latest idée fixe – desalination. Foreign Minister Rashid Meredov this week headed to Germany to scope out interest from companies that might build seawater desalination projects in Turkmenistan. There is no indication of whether Meredov had success any on that front, but what he definitely did get was an earful from German Foreign Minister Heiko Maas on the need to improve political freedoms and human rights. If Turkmenistan is looking to Germany, it may be because the company it has previously relied on to build desalination plants, Turkey’s Polimeks, is growing exasperated working in the country. Earlier this year, Polimeks, which built the falcon-shaped airport in the capital, suspended work on a major highway project after the government failed to keep up with payments. The Germans have a confirmed track record in this sector in Turkmenistan. According to documents posted on its website, German engineering firm PWT was involved in Turkmenistan’s first-ever desalination plant project. And Dragon Oil, an Emirati energy company with sizable operations in Turkmenistan, notes on its website that another German firm, Chriwa GmbH, helped build a smaller desalination plant in 2009 in Khazar. Even the visiting head of the Asian Development Bank, or ADB, Takehiko Nakao, got the salt sales pitch. On November 14, Berdymukhamedov met with Nakao to solicit further investment and loans – for desalination plants, among other things. The meeting came just five days after the ADB approved a $500 million loan to improve Turkmenistan’s electricity transmission network. Alas, the ADB makes no mention of plans for funding desalination plants in its freshly released 2019-2021 Country Operations Business Plan for Turkmenistan. The document also pours some cold water on the Turkmenistan-Afghanistan-Pakistan-India, or TAPI, natural gas pipeline project, noting that while the ADB could provide $300 million in loans, this is "strictly in standby mode.” For big-ticket projects to advance beyond standby stage, they must undergo due diligence to ascertain that they will benefit public welfare and pose no risk to a country’s debt and fiscal position. Potential white elephants like TAPI may struggle to overcome that hurdle. Still, the turnout at a November 15 Turkmen-Italian business forum demonstrates that European interest in Turkmenistan’s energy sector remains solid. Energy giant Eni, General Electric's Italian subsidiary Nuovo Pignone and construction firm Maire Tecnimont were among the companies that sent representatives. The profile of the companies – Nuovo Pignone, for example, manufactures gas compressors – hints at the possibility that they are sniffing around for opportunities in case the Trans-Caspian Pipeline ever becomes a reality. One major outstanding issue for the Trans-Caspian Pipeline is that Azerbaijan and Turkmenistan have not yet agreed on their subsea boundaries. There may be some movement here. During a November 16 Cabinet meeting, Berdymukhamedov ordered the Foreign Ministry to prepare for the visit of Azeri President Ilham Aliyev. This could prove a seminal event for the region. Turkmenistan and Azerbaijan could fairly be described as frenemies, and Aliyev has not visited Ashgabat since 2008, although the two presidents did meet in Baku in August 2017. In another positive regional development, RFE/RL’s Tajik service, Radio Ozodi, reported on November 18 that parliament in Tajikistan has ratified a bilateral agreement to ease doing business with Turkmenistan. This marks a change of mood music since the still-unexplained spat that led to Turkmenistan refusing to allow Tajik freight through its territory some weeks ago. 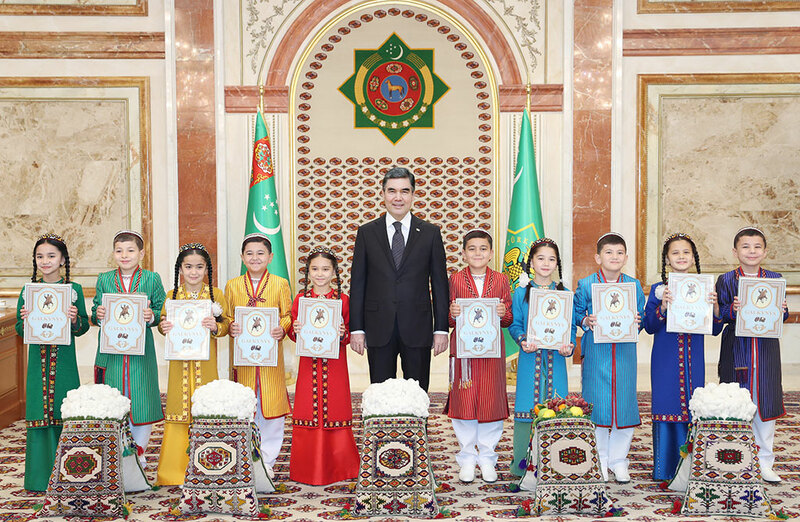 Akhal-Teke is a weekly Eurasianet column compiling news and analysis from Turkmenistan.